One just can’t argue with such poetic prose; smell is, after all, one of the most important parts of our existence, enticing us, warning us, dissuading us, lulling us into dreamlike states and seducing us to lose all control. From Heston Blumenthal bursting marshmallow scented balloons over his audience to the Romans who would douse doves with rose water before releasing them into the hall, the magic of perfume has always remained an art form that has appealed and been accessible to every layer of society. Whether it’s an artisan perfumier or apothecary catering to the whims and fancies of Marie Antoinette or a peasant incense maker, without the power of smell, life would be extremely dull and flavourless. I was given a book by the celebrated perfumier Mandy Aftel that beautifully narrated the history of scent and it was this book that got me thinking about creating an edible perfume of sorts. Many of the ingredients in a cooks repertoire are used in the making of perfume – rosemary, rose, lavender, citrus fruits and hundreds more, but very few perfume ingredients ar.e used in food preparation anymore. I wanted to use some of these ingredients along with a few lesser known culinary aromatics to create my edible perfume. After months of trial and error, I had finally settled upon my menu. Just as a perfume has 3 layers – top note, middle note and bottom note, so too, would my menu with different dishes revealing their hidden edible scent at different times. After all, as we know, in a perfume the initial aroma is not what you will smell after 5 minutes, with even that secondary aroma changing after a few minutes to reveal hidden depths. I wanted to start with something earthy, yet not overpowering. I decided to serve my bread with Atlast Cedar wood infused butter. From the Atlas mountains, this aroma was also used by the Egyptians as one of the unguents used for embalming and is often used in perfume to hold a blend together. The Canadians soak the wood in salted water, then place salmon on the top and put it over the barbecue for their Cedar Plank Salmon, whilst in aromatherapy, it’s used to calm and soothe, sometimes acting as an aphrodisiac. I chose this to go with the bread because as a base note, it’s scent is slowly revealed and the guests have about 10 minutes from being seated to being served their first course. To start them with a big bold aroma would have marred the effect of the first course, so a base note oil, revealing itself slowly and unobtrusively seemed the best way to start. The bread was a thyme soda bread – soft, dense and also earthy. 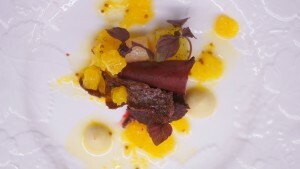 Following this was a first course of Beetroot, Bergamot, Orange and Mustard. We’re quite familiar with the flavour of bergamot from Earl Grey tea, but apart from this it’s use in the culinary world is fairly unknown. Being a citrus fruit, the pairing with orange was easy, but then I wanted to contrast this highly aromatic and fresh flavour with something muskier to balance the flavours and beetroot came to mind immediately. I used 3 types of beetroot for this – red, yellow, white in different preparations whilst the bergamot was infused into a mustard and orange dressing. For the beetroot, I marinated the red with sumac and a fabulous beetroot ketchup by the lovely Foraging Fox, whilst the white beetroot was marinated in a Hebridean seaweed and lemon dressing by our friends over at Saladworx. 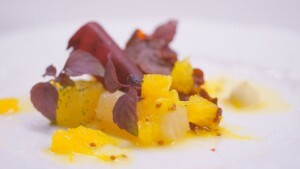 The yellow beetroot had a treatment of salt, lemon zest, thyme and toasted breadcrumb. Along with this there was a thin slice of pickled red beetroot and a crunchy puffy sheet of beetroot tapioca (yes, that’s a lot of beetroot!). The dressing was fresh orange juice with chopped orange segments, olive oil, bergamot absolute and grain mustard. What is an absolute then? Unlike essential oils, an absolute is a much purer and cleaner extraction. This is because of low-temperature extraction from the organic material using ethanol that evaporates to leave a concentrated oil behind, that doesn’t damage the aroma of the original organic compound. Essential oils on the other hand, are produced by distillation or solvent extraction that produces less concentrated and sometimes poor quality oils. Of course, as with anything that is a concentrate, one has to be careful how much is used and in the case of these oils, just a few drops is enough. 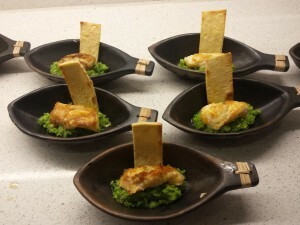 Moving on to the fish course, I opted to use the scent of Sandalwood. In India, we often flavour chicken with a sandalwood paste. Sandalwood is from the highly aromatic Santalum genus of trees and is very highly prized and expensive. The government of India has banned the export of sandalwood – both in ornaments/artifacts made from Sandalwood as well as the wood itself as Sandalwood plantations have to be licensed, thus driving the black market. In recent years, though, Australia leads global production of sandalwood. 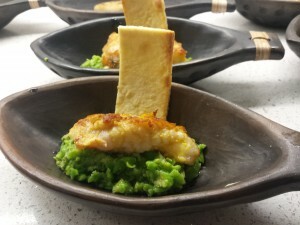 Right, back to the food – I wanted to use a good meaty firm fish for this dish and monkfish immediately came to mind as it would hold up to the powerful Sandalwood oil I was using. Nothing but a simple marinade of turmeric, sandalwood and ginger so that there’s nothing to confuse the smell and flavour of the dish. This was paired with a fresh pea, spring onion and mint relish and a delicate saffron flatbread, using a beautiful saffron extract by Holy Lama Spice Drops (this creates a white flatbread with a delicate saffron aroma). Saffron and Sandalwood are well known complementary ingredients in perfume and cosmetics, and here they come together perfectly. As both ingredients are base notes in perfume, their flavour doesn’t reveal itself on the first bite, but takes a few minutes to surface so that by the time you’ve finished your plate, you feel the full effect of flavours dancing on your taste buds until the next course arrives. 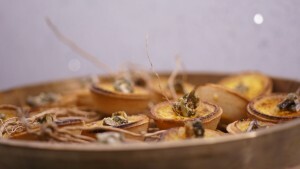 The vegetarians had Jerusalem artichoke with lime and sandalwood. 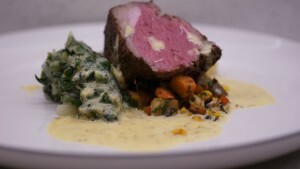 On to the main, which was Rump of lamb with Tobacco & Cocoa absolutes, curried yoghurt sauce, sautéed vegetables, spinach mash. Tobacco and cocoa are often used in perfumes to ‘dirty’ up a blend, to muddle the perfume and give it a masculine edge. When used to marinate meat, they intensify the flavour of the meat and make each mouthful intensely delicious. What it doesn’t taste of, is smoke as one would expect, but rather it smells rich, dark, hay-like, earthy and very fragrant whilst the cocoa adds a delicate bitterness and another layer of richness that accentuates the lamb. For the vegetarians, I used the same combinations with mushrooms. This was paired with some sautéed vegetables, crushed potatoes mixed with spinach and a curried yoghurt sauce for a little bit of acidity to tidy up the dish. Magical! Now then, on to the best part of the meal and my favourite – DESSERT!!! 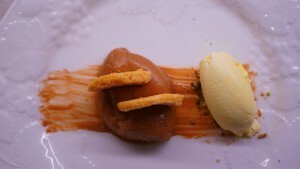 This is the first dish that I came up with for this menu, using Frankincense and Pine Needle absolutes. Apart from being one of the 3 gifts that the wise men took when Jesus was born, this resinous substance comes from the Boswellia tree and has been used for thousands of years even back to the time of the Egyptians when it was traded across North Africa and the Arabian peninsula. The smell is nothing short of heady – it’s warm, balsamic and sweet aroma have always been associated with religious and spiritual uses and very rarely in food. However, when made into shortbread with a few drops in the dough and a few drops infused into sugar to sprinkle on top, the result is, pardon the pun, divine. Now the pairing with chocolate is perfect – the creamy and rich flavour of dark chocolate is the perfect vehicle for showcasing frankincense. I added a bit of black pepper as a contrast to the sweetness and richness of both the chocolate and frankincense; the pepper hitting the back of your throat as a little surprise. 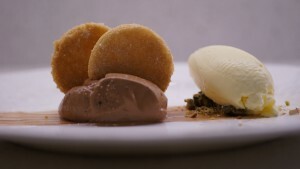 The pine needle ice cream offered a cool freshness to the whole dish, cutting through the richness and cleansing the palate, almost, with it’s fresh, citrussy flavour. Following this, it was time for a one of my favourite aromas and flavour – vetiver, or khus as it’s known in India. Whilst no stranger to cuisine in India, the culinary use of this highly aromatic grass is relatively unknown outside the subcontinent. In summers, an infusion of vetiver is sprinkled over curtains and drops added to water coolers across India to perfume the hot, sticky summer air whilst imparting a cooling and much needed refreshing effect and cordials infused with vetiver are drunk with plenty of ice to keep cool. The extract on the other hand, has a flavour quite different to the infusion, revealing itself as a smoky, woody scent. 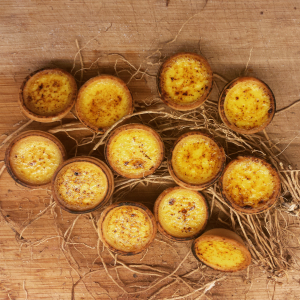 For my petit fours, I added a few drops of the oil to a custard mix before pouring that into little tartlet cases and baking until set. To bring in that freshness of the grass, I placed the tartlets over some of the dried grass and under a ‘paan daan’ (a brass stand and dome traditionally used for serving paan). The dome was then filled with the sweet and cool fragrant smoke of the grass before being set on the table. The effect was as I had hoped – the cool smoke wafting across the entire table whilst the smoky vetiver tartlets were passed around. For me, this was a personal high with ever dish being exactly how I had wanted it to be and none of the flavours overpowering one’s palate as my guests were still able to taste each perfume in every dish with no saturation. We’re doing 2 more dinners with this menu on our regular supperclubs that we host through Grub Club, but are also offering it for our private events as well, so if you missed the supperclub and want to give your guests something different and memorable, just give us a shout and we’ll come along with few plates of perfume for your guests to eat.